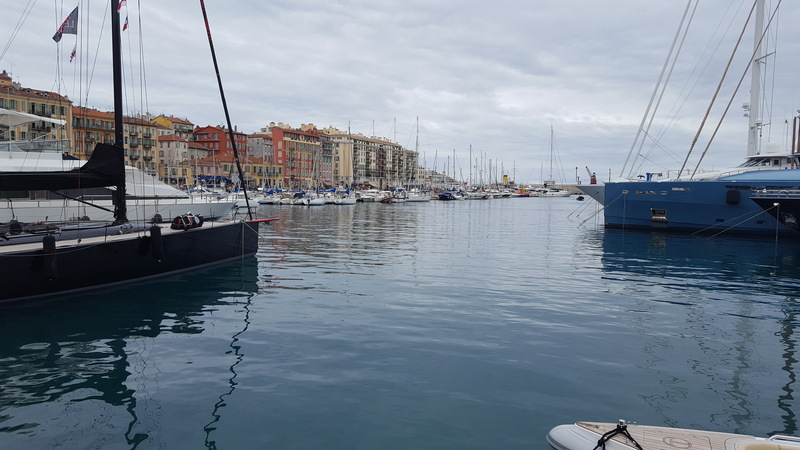 During our most recent visit to Nice, during April of this year, we explored the historical Old Town. The previous visit was August 2017 and rather hot. I’ve included some photos from the August 2017 visit, to show the superb Nice park and how much the French children enjoy it. Well, not just the children, but adults too. Note the two chaps doing handstands; they weren’t young! Nice has a long, pebble beach with the bluest sea I’ve had the pleasure to see. In fact, the first time I visited Nice (about 5 years ago), I remember an overwhelming joyous feeling upon viewing the vivid azure water and felt like I’d come home. (Still feel like that, but really adore Juan Les Pins, as the place to stay.) 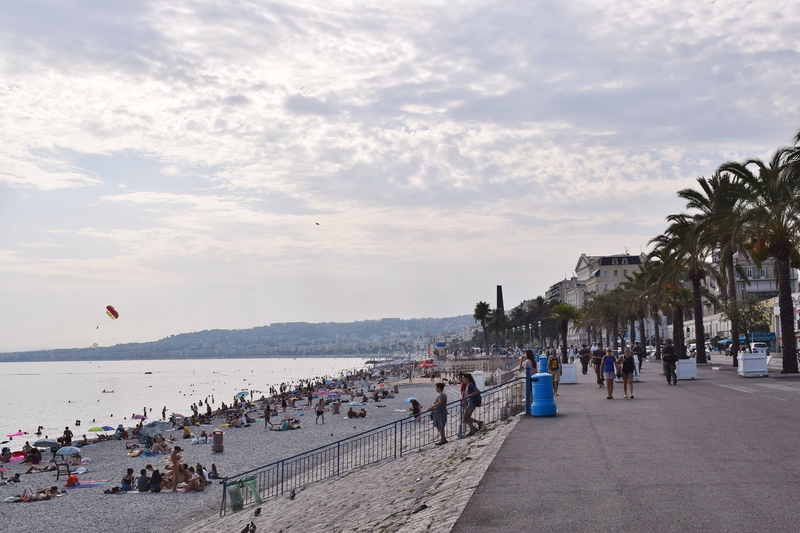 The coastal area of Nice, is called Promenade des Anglais (Promenade of the English). This is because the wealthy English aristocracy spent time in Nice because of the fine weather and panorama along the curving coast. You will see palm trees, pergolas, walkers and lots of French people with small dogs. They seem to love their little dogs and quite right too. During a bad English winter in 1820, the Rev. Lewis employed workmen to build a promenade and it became France’s first piece of tourism infrastructure. It derives much of an Italian influence because it was the Kingdom of Sardinia. Not until the Treaty of Turin in 1860, did Nice become integrated with France. It was also part of the Grand Tour, which wealthy people enjoyed during the 18th century. This was a long holiday and they enjoyed extensive travelling through France and Italy whilst taking in the cultural sights. When I studied literature, I remember reading about Wordsworth and Coleridge undertaking such a journey. 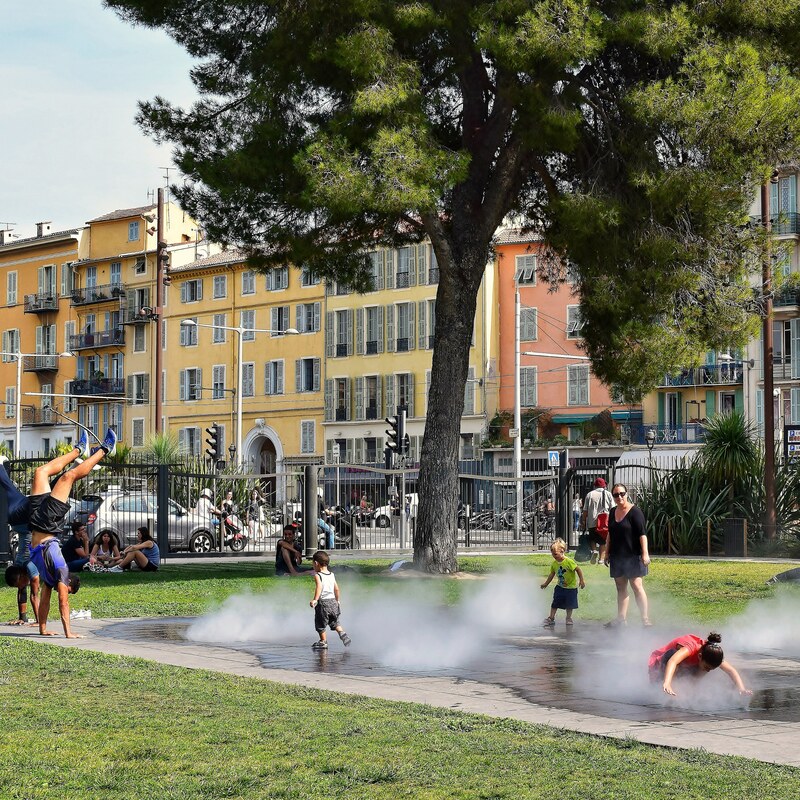 The region has a splendid mix of beach life, shops, restaurants, hotels, history, architecture and a useful tram going through the centre of Nice. 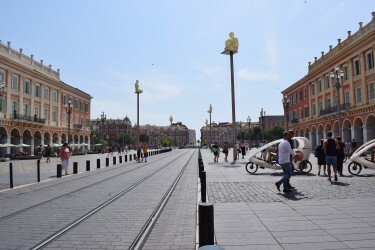 The Place Massena and surrounding area, is a spectacular city square full of bustling life and so impressive because of the Italian red ochre architecture. The lack of traffic, is an inspiring ideal and endorses a thriving Mediterranean square which is quite stunning. The historical area is lovely with the colourful houses, winding streets, old traditional shops and markets. We ended up, eventually, at the harbour and decided to have a spot of lunch. We sat down at a busy café. They were all busy, but this one supplied a good menu so we ordered, and waited. And waited. And waited some more. Obviously, the French don’t mind the interminable wait for their food. Listening uselessly to the incessant, loud chatter, I became obsessed with watching food leaving the kitchen. Well, I was just beginning to die of boredom, when the long awaited food arrived and it was, I must declare, delicious. After which, when trying to pay, the card machine wouldn’t work, and the owner started to laugh hysterically whilst pulling and pushing at the wires of the credit card machine. By this time, I strolled towards the bobbing boats thinking I may throw myself in (not really) and my husband came out joyfully saying he has now, finally, paid for our meal. Incidentally, I do prefer to pay for my drink, as in the British pub, and sit down then… well… just leave the building. Find it annoying to drink your beverage and sit there and wait and wait and then have to beg a server for the bill. Anyway, I can certainly recommend Nice for a long weekend away or holiday. It has an abundance of history, culture, coastal and culinary delights. It is the fifth largest city in France and is exciting and interesting. The people are friendly and welcoming. 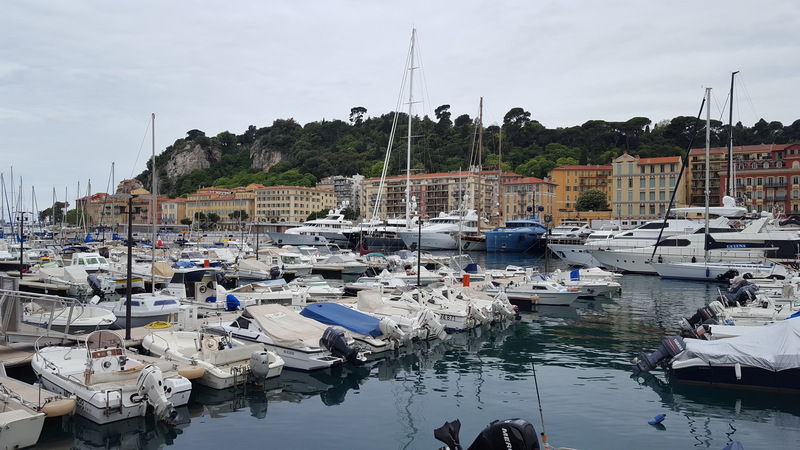 There are plenty of inexpensive hotels and of course, Easy Jet flies to Nice, which is a short flight from Gatwick, London. Is about whether it is best to stay in an apartment or a hotel plus some tips about what to look out for when choosing holiday accommodation. After living in this country for almost a month now, the wait for food is something that, as an American is very hard to get used to. I can only imagine what it’s like if you’re used to pubs where you can pay right away. The country is beautiful, but boy, do I miss the fast customer service in the U.S.
Hi Andrea, I also get really frustrated with the continental practice of settling up for food and drink, right at the end. The waiting staff invariably disappear as soon as you’re even thinking of leaving; meaning an annoying, and sometimes lengthy wait before you can pay them. We’ve never really suffered from slow service in Germany; certainly not when it comes to bringing the food out. It’s just being able to pay for the damn stuff which annoys me. I’ve now learnt to ask for the bill, as soon as the final drinks are brought over. Otherwise you can sit around for ages, and if you’ve a bus or a train to catch, you can end up missing it. It sounds as though you had a lovely stay on the south of France. I once travelled through the region by train, but didn’t have the time to stop off. Having seen your photos, and read your descriptions, I’m very tempted to add it to my list of places to visit. Paul. Thank you Linda. 🙂 Won’t be too long before I’m off again. Cheers A.